Trained at the University of Milan, Italian-born Umberto Finzi (right) headed the European Fusion Programme from 1996 to 2004 and played a key role in the negotiations that led to building ITER in Europe. 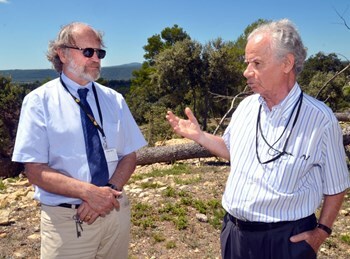 He is pictured here at ITER with long-time acquaintance Jean Jacquinot, former director of JET. ITER owes much to a few. At different moments in the history (and prehistory!) of the project, a handful of individuals made moves that were to prove decisive. Among this band of godfathers—whether scientists, politicians, diplomats or senior bureaucrats—Umberto Finzi stands prominently. Finzi, who retired from the European Commission in 2004 but continued to advise the Director General of Research until the conclusion of the ITER negotiations in 2006, belongs to the generation who embraced fusion research in the early 1960s at a time when plasma physics was still in its infancy. A physicist turned bureaucrat—he was called to Brussels to take care of setting up JET in 1978 and was appointed Head of the European Fusion Programme in 1996—Finzi played a key role in the negotiations that led to building ITER in Europe. An ITER godfather in his own right, he nevertheless insists on the "collective action" that, under four successive European presidencies, led to this decision. Time has passed. The "paper project" whose roots go back to the late 1970s, years before the seminal 1985 Reagan-Gorbatchev summit in Geneva, is now a reality, as tangible as it is spectacular. When he toured the ITER worksite on 30 July, Umberto Finzi took the full measure of the progress accomplished since his last visit in 2006, when all there was to see was a hilly, wooded landscape and a high pole marking the future location of the Tokamak. "During most of my professional life," he said, "ITER was a dream. You can imagine my emotion seeing these tons of steel and concrete. This reminds me of the famous message by Hergé¹ to Neil Armstrong: "By believing in his dreams, man turns them into reality." "ITER is a difficult venture," he added, "and difficult ventures requiretime and patience. The effort is not only scientific or technological. It lies also, and maybe essentially, in the planning and coordination." ITER, with 35 participating nations, could have been a Tower of Babel. "On the contrary," says Finzi, "it is the exact opposite of a Tower of Babel, a beautiful demonstration of worldwide understanding. No project has ever associated so many different nations. To me, this is the most important aspect of ITER, a historical dimension that reaches beyond the project's scientific and technological objectives." (1) Hergé (1907-1983) was a Belgian cartoonist, creator of the world-famous characters Tintin and Snowy. Between 1930 and 1986, Hergé published 23 albums of The Adventures of Tintin, selling a total of 200 million copies in 70 languages. Fifteen years before Neil Armstrong, Tintin, Snowy and other recurrent characters in the series walked on the Moon in the 1954 album "Explorers on the Moon."